The Pimenta Homestay is a unique Spice Garden Bungalow located on the slopes of Maniyanthadam Hills connected to the Wesern Ghats . It is located in Haritha Farms , a spice and coconut garden of 2.5hectares situated on a hilly area of land facing paddy fields and a small hillock. See the spices growing. Explore the neighboring villages. The Pimenta Homestay offers clean and comfortable cottages with private verandas are built in the traditional style and over look the lush native forest. Cottages have private bathrooms with shower, water closet and sink. All the cottages have two twin beds. Accommodations are a great value as prices includes all meals.The rooms are having insect screen, and fans. 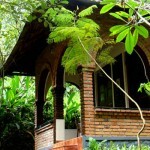 The cottages are not air-conditioned but located in the shade of the forest garden. Food– The Pimenta Homestay offer a variety of Eastern Kerala specialties and other Indian dishes home cooked with the flavour and aroma of fresh farm grown spices and coconut.Facilities for making your own coffee, tea or fresh lime soda are available in communal area. The Pimenta is easy to access by road from any where in Kerala and in an hour from the Cochin Airport and railway stations of Cochin, Alwaye and Kottayam. It is about 6 km from Thodupuzha.